First, a bit about process. I saw the Daily Caller wine club in a tweet and was amused and intrigued by the concept. The wines are from the Central Coast of California and I was curious about who made them. 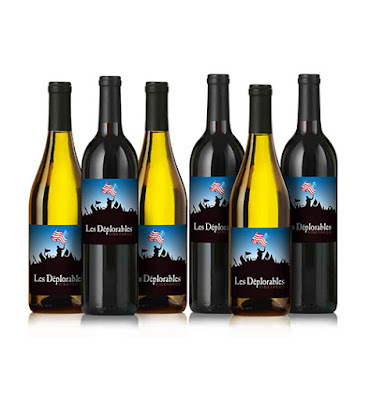 I wasn't planning to write anything; there's no shame in making private-label wine to venerate the sitting U.S. President, especially one who already has his own wine label. This is how reporting works, even (or maybe especially) for bloggers. Something strikes you as interesting, so you try to learn more. It wasn't the 306 wine that caught my interest: it was the "Basket of Deplorables 6-pack." It's quite clever; amusing on several levels, beyond turning Hillary Clinton's biggest verbal misstep into a wine label. It's a basket of wine, and I do find generic Chardonnay and Cabernet kind of deplorable. I chuckled. I may dislike Trump, but I haven't yet lost my sense of humor. I went to the website of the TTB (Alcohol and Tobacco Tax and Trade Bureau) to see who had registered the label, to see if I could find out who made the wines. All wine labels must be registered in the United States. It was mostly curiosity, but also because I talk to wineries all the time, it's worth knowing which ones I shouldn't discuss politics with. Neither of these wine labels is registered with the TTB. They call it a "COLA" -- Certificate of Label Approval. If either of these wines has one, I couldn't find it. I'm a blogger, not a lawyer. I didn't know if that is illegal or not. Maybe wine clubs have an exemption from federal label laws, I thought. So I contacted a beverage attorney, John Hinman of Hinman & Carmichael in San Francisco. I forwarded him a link to the Daily Caller wine club website. And this is where the story gets interesting. First, this label violates the TTB prohibited practices regulations because it features a flag. (f) Flags, seals, coats of arms, crests, and other insignia. No advertisement shall contain any statement, design, device, or pictorial representation of or relating to, or capable of being construed as relating to, the armed forces of the United States, or of the American flag, or of any emblem, seal, insignia, or decoration associated with such flag or armed forces; nor shall any advertisement contain any statement, device, design, or pictorial representation of or concerning any flag, seal, coat of arms, crest, or other insignia likely to mislead the consumer to believe that the product has been endorsed, made, or used by, or produced for, or under the supervision of, or in accordance with the specifications of the government, organization, family, or individual with whom such flag, seal, coat of arms, crests, or insignia is associated. Second, there is NO privilege that permits the sale of wine without an approved COLA. Even an exempt wine for intrastate sale only has to get an exemption COLA. I contacted The Daily Caller and asked to speak about the wine club. I gave them a week. No one has responded. So I'm running the blog post, and maybe they'll respond now. Here are a couple disclaimers that they may offer. First, most media organizations have little to do with their wine clubs, which are run by third parties. The Daily Caller seems closer to its wine club than most because of the wine names, but it's possible that the publication is barely involved. Second, and I think this is likely: these are probably not the legal front labels. Many wineries register what looks in stores like a back label as the front label, because there are federal regulations requiring certain information on the front label, and I don't see all of that information. It's possible that the wines are registered under other names that are printed on the other side of the bottle -- Tucker's Wine No. 1, or whatever. These back labels also must be approved, but having a different legal name for the wine might explain why I couldn't find them in the TTB database. That said, the flag regulation Hinman cited would still seem to apply. Perhaps The Daily Caller can contact me and explain how these wine labels are legal. It's also possible they might run a story about it on their own website, but if you see a followup here, you can believe it. Very interesting. John Hinman knows his stuff too. I think that the display of the flag is also incorrect as they are showing it backwards. At their website there are no real descriptions of the wines themselves. Big red flag. Probably surplus, surplus juice to make a $1.00 wine that they are trying to pass off as a $15+ wine. Even worse than most of the general "wine clubs". It is a just buy the wine because of the label and cause not because of any quality. Also as you noted the label names are suspect-very generic. Just another ripoff from the right-wing. The United States of America [or government] as it might imply tacit approval or endorsement. one does not need a COLA. But I believe it must be stated, 'Sold only in California'.